So yeah, Vader worked out pretty well. As promised, I'll go into my thinking for the list and then get to the details of the tournament. If you think about it, this is somewhat of a play off of the old school Clonisher list, but with some new wave 6 goodies. I firmly believe that External Racks were exactly what the Raider I needed to be amazing. They generally only get a single good shot anyway, so I don't see the single use limitation as a problem. They're also pretty flexible. If your target has nothing but redirects, overload it with one giant shot of 4 blacks and 2 blues out the front. If your target has a single brace and you have a double arc, you can use them out the side, using 2 black and 2 blue out the front and 3 black and 1 blue out the side for similar damage. The bottom line is that for 51 points, an ER Raider packs a serious punch. The Flechette Raider and the squadron screen have been a work in progress for pretty much all of wave 5. I think I finally have it right with wave 6. Timing is the hardest part. 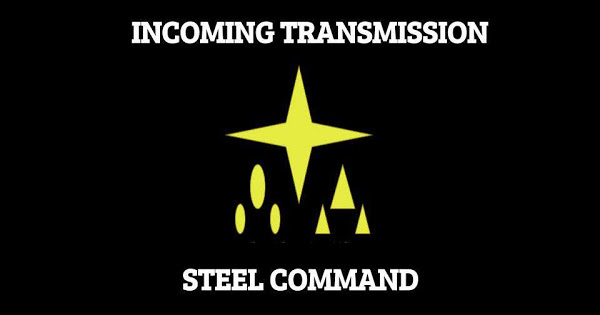 Commit the squadrons at the wrong time, they die before the Raider can get in there to lock down movement. Commit the Raider at the wrong time, and it dies before it gets the flechettes off. Still, I firmly believe that it takes just one well timed flechette shot to swing an entire game. Cienna, Valen, and the TIEs are the combo that I've found hits the sweet spot between cost and durability. The TIEs are a nice cheap source of 6 hull points, Cienna is seriously frustrating to remove, and Valen adds quite a bit of consistent damage. 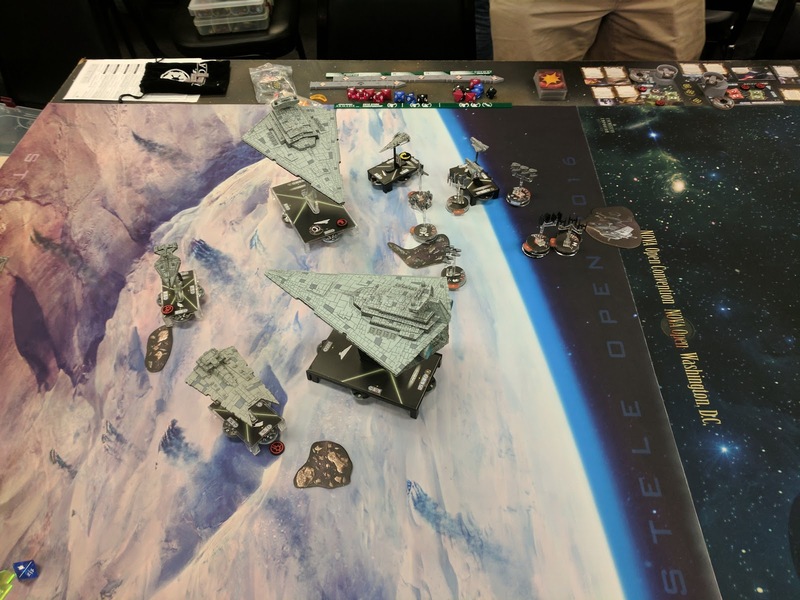 My first game was against Jerjerrod Triple ISDs in a Blockade Run (I was first player) featuring Avenger/Boarding Troopers on both sides. With activation advantage I was able to throw out a lot of firepower without taking too much damage in return. Suppressor really shined here, giving my Avenger a medium range shot that couldn't be braced by my opponent's Avenger. I then followed up the next turn with my Boarding Troopers for the killing blow. I got a second ISD with the combined firepower of the ER Raiders and Avenger. Unfortunately I didn't quite get it with the first Avenger shot, so I had to waste a front arc for two damage to make sure I didn't eat two ISD front arcs. That cost me the tabling. Still, I only lost Suppressor, a Raider, and two TIEs, giving me an 8-3. 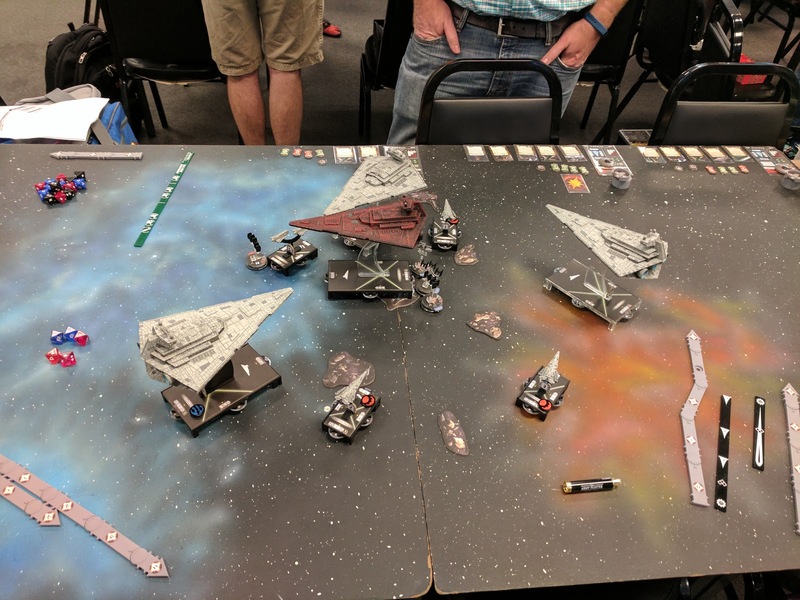 My second game was against an Ozzel list with an ISD II, Demo, and a Kitten supported by a strong squadron wing. I went first and elected to play his Solar Corona. I seriously botched my early positioning on this one, moving Instigator straight into the ISD's front arc and getting out maneuvered by Demo to lose another Raider. I had lost two Raiders with only really a single flechette shot to show for it. Luckily Vader got angry and bailed me out. The Demo kill shot on my ER Raider left it exposed to Avenger. I risked saving the Boarding Troopers for later and it paid off. Avenger killed Demo and turned right into my opponent's ISD. Because it had already eaten a volley from the second ER Raider and some longer ranged Avenger shots, I was able to use the Boarding Troopers to get the kill. I lost all three Raiders in this match eventually. Avenger's two kills kept me at a 70 MoV for the 7-4 win. You know how sometimes you have a game where every theory you have about your list comes together in the best way possible? That was this game. I had the higher bid by 4 and took his Contested Outpost. My opponent had 2 Demos, a Quasar, 2 Gonzos, and an impressive squadron wing all led by Jerjerrod. I was on table two, so I knew I needed a big win. When I saw this across the table my heart sank a little bit. 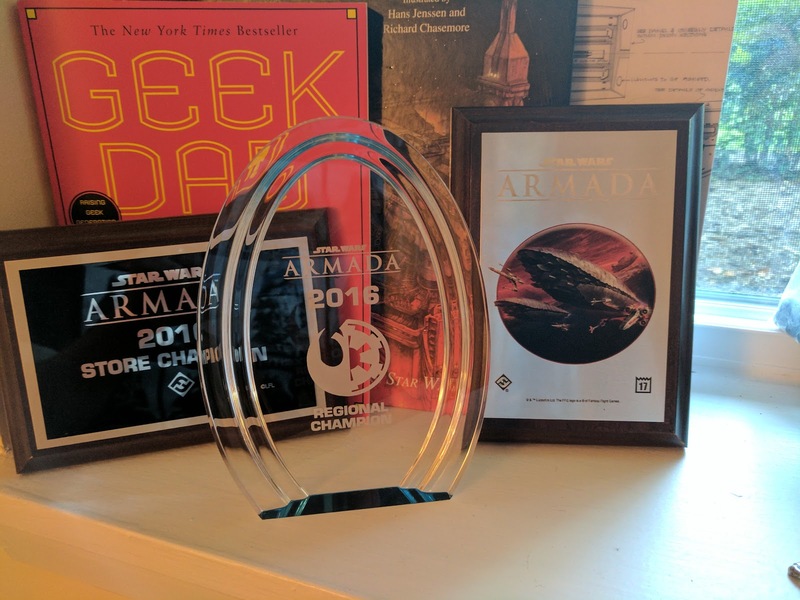 I was worried about winning, much less winning big. But then everything did exactly what it was supposed to do. Instigator completely neutered the squadron wing with a rear flechette shot while Cienna and Valen ran rampant. It also teamed up with a ER Raider to torch the Quasar. The other ER Raider chased down Gozantis. Finally, Avenger managed to juke its way into killing both Gladiators in the same turn. I ended up using Boarding Troopers out the side to punch through a weakened Gladiator side arc so that Avenger's own side arc could finish the job. I only lost 2 TIE Fighters, finishing out the tourney with a 10-1. There's not a whole lot to add to my above strategy. Everything came together almost exactly as expected. The trick was just learning to fly it. I made some mistakes in the first couple games with the Raiders that I corrected in the final game. I cannot stress how great those are with External Racks. Well worth the investment in my mind. Avenger I think is the new big bad of this wave. I think I see what I would do if the shoes is on the other foot, but I'm not going to act like I would have done better against it than my opponents. FFG has truly created a monster. . I have no concept of how to fly this list, and yet John played it well enough to amass 24 tournament points. It's not like he was playing bad players either. That final round was against the defending Stele Open champion. And Jon would have swung that to a 9-2 had a lucky VCX shot not gotten the last point of damage on his Demo on the last turn. Congrats on the win! Great to see Vader doing well, he is a fun favourite of mine. And looked very good with your list. Avenger is definitely very powerful now. And with Sloane and the FAQ (Rhymer/Rieekan) hammering enemy bomber ace wings, big ships are back in business. Really not any different from before: dodge the front arc. I think I am too new to the tournament scene cuz I'm not seeing which I next Ives you choose. That's because I forgot to post them. Sorry! I was most wanted, contested outpost, and salvage run. I had first player throughout the day, so they didn't matter. What sort of list gives this monstrosity of a list pause? Played it twice today with horrible results for my opponent. 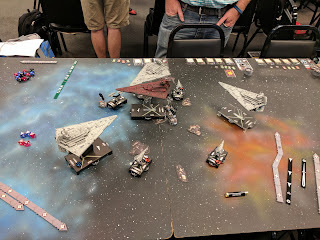 One table wipe, and another frustrating win with no casialties for Vader. My latest Madine MSU list for sure: 3 TRC90s with ETs, Admo, and 2 GR-75s. Avenger/BT is completely wasted on MSU and Madine lets you dodge around the threatening arcs.